Ganesha is just like any other kid, except that he has the head of an elephant and rides around on a magical mouse. And he loves sweets, especially the traditional dessert laddoo. But when Ganesha insists on biting into a super jumbo jawbreaker laddoo, his tusk breaks off! 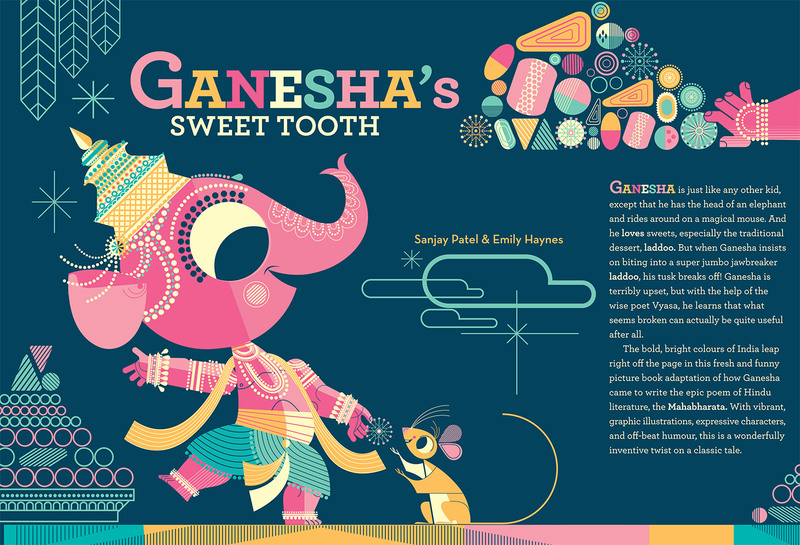 Ganesha is terribly upset, but with the help of the wise poet Vyasa, he learns that what seems broken can actually be quite useful after all.The bold, bright colors of India leap right off the page in this fresh and funny picture book adaptation of how Ganesha came to write the epic poem of Hinduliterature, the Mahabharata. With vibrant,graphic illustrations, expressive characters,and off-beat humor, this is a wonderfully inventive twist on a classic tale.